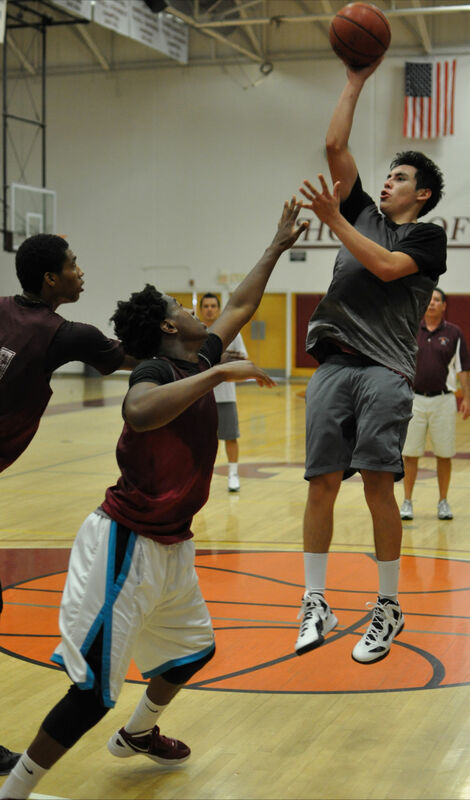 Lucciano Gamiz, 6’3″, 185, 2-guard graduated from Antelope Valley’s Quartz Hill High School in 2011. Gamiz is a natural shooting guard but played the point guard position in his senior year in high school as he was the best ball handler on the team. Gamiz impressed Coach Taylor with his natural three point shooting but with D-1 two guard, JJ Johnson holding down the shooting guard position, it looked like Gamiz would be relegated to the pine in his first year. The AVC coaching staff and Lucciano agreed that he would red shirt his first year at AVC and “get strong” in the weight room and learn the defensive and offensive sets. The red-shirt year was an exceptional basketball learning year for Gamiz. He got strong, quick, and learned the defensive/offensive system. Academics have never been a problem for Lucciano. His grades in high school and college are in the top 10% of all students. During his red-shirt/basketball freshman year he completed the majority of this AA degree taking classes qualifying him for University of California schools with a 3.6 GPA. In fact, he decided to test the waters and applied this year to the top academic schools in California…including his favorite, UCLA…and was accepted by them all. Lucciano’s first year of college basketball was a success academically and basketball-wise. He played his way into the starting line up. Led the team in 3 point shooting percentage…38%…slashed the middle, played outstanding defense, was the second point guard on the floor when needed. Gamiz is an outstanding academic student who can go to any university in the United States. He also loves to play college basketball. Lucc is now being recruited by mid-major D-1 teams who love his basketball skills and his superb academics. One of the professions that he is considering is Law. Lucciano has already worked out that a good sophomore basketball year at AVC will give him a D-1 scholarship at a university where he could play basketball and excel in academics. He could then enter Law School/Professional Schools at one of top academic schools debt-free. Sounds like a lawyer doesn’t he! Look for Lucciano Gamiz to have a great basketball, academic and scholarship year at Antelope Valley College. He was accepted into UCLA and a host of other academic Universities this year but his love for basketball kept him at AVC for his sophomore year. Known for his excellence in academics and three point shooting, Lucc has added to his repertoire intense defensive skills, assists, ball handling and leadership skills on the floor. 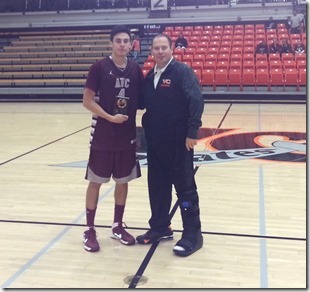 Gamiz was named to the All-tournament team in the Ventura Tournament. Just a step in Lucciano’s well thought out plan. Lucciano decided upon the three full ride offers he received between after site visits; D-2 Fresno Pacific University, D-1 St Francis University, NY, and D-2 Drury University, Mo.. Based on a number if issues, Gamiz will be finishing his college basketball career at Drury University. 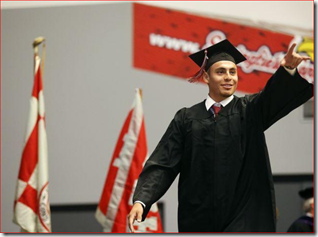 Lucciano Gamiz graduates from Drury University after two great years leading their basketball program and now graduating with the coveted Baccalaureate degree. Quartz Hills High School, Antelope Valley College and now Drury University graduate. Don’t be too surprised in the future if you see another advanced graduation announcement. Very bright man. Congratulations to his parents as well.